WASHINGTON (THE NEW YORK TIMES) — House Democrats have added more than $1 billion in border-related spending to a package of funding bills that would reopen most of the government, even as President Trump said he would have a “major announcement” on Saturday about the border and the shutdown stalemate. 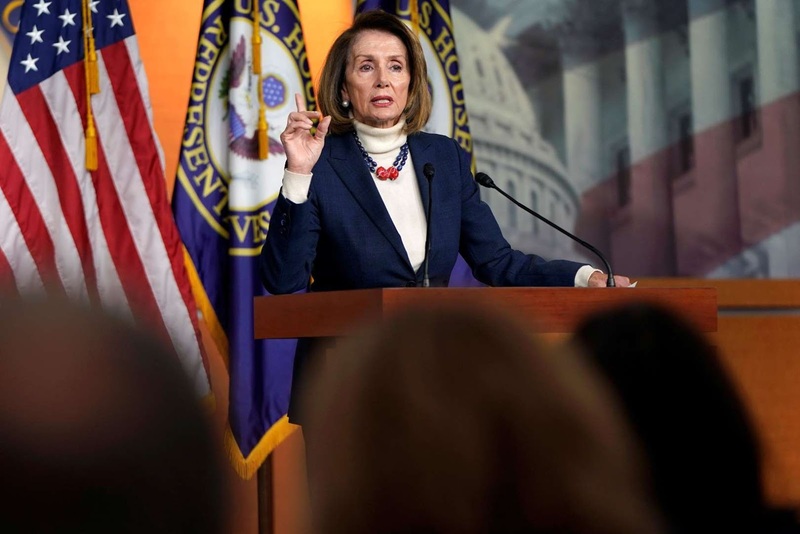 Both sides’ actions were the first indications of possible movement over the shutdown after a week of inertia and harsh words between Speaker Nancy Pelosi and Mr. Trump. That conflict culminated when the president, responding to Ms. Pelosi’s request that he postpone his State of the Union address, announced on Thursday that he would not authorize the use of a military plane to fly her and other members of Congress to Afghanistan to meet with American troops. Ms. Pelosi said Friday she was postponing the trip after the White House leaked her alternative plan to use a commercial airline because she had been advised it was too dangerous. “Why would Nancy Pelosi leave the Country with other Democrats on a seven day excursion when 800,000 great people are not getting paid?” Mr. Trump asked on Twitter before Ms. Pelosi’s office had announced the postponement. The trip had actually been scheduled for six days, departing late Thursday and returning on Tuesday. The issue came up in a meeting of the Democratic caucus this week as Ms. Pelosi was briefing rank-and-file lawmakers about her latest broadside against Mr. Trump over the shutdown: her letter requesting that he delay or cancel his State of the Union address this month in light of the security measures that would have to be provided by federal workers who are working without pay. Mr. Trump’s response was to prevent Ms. Pelosi from taking her trip on a military plane. His letter to Ms. Pelosi announcing that step also disclosed her itinerary, which was secret given that Afghanistan was her destination. Official congressional trips are kept confidential for security reasons, particularly when they involve travel to war zones and high-ranking leaders like the speaker, who is second in line to the presidency. “You never give advance notice of going into a battle area — you just never do,” Ms. Pelosi told reporters at the Capitol, adding that Mr. Trump may not have understood that because of his inexperience. After Ms. Pelosi rushed to salvage the trip by making alternative travel arrangements to fly commercial instead, people close to Mr. Trump who had been briefed revealed the speaker’s plans to reporters late Thursday. By dawn on Friday, said Drew Hammill, her deputy chief of staff, facing a heightened State Department threat assessment and amid concern that the administration’s leaks had further compromised the safety of those involved, Ms. Pelosi canceled the trip. As the bad blood continued between the president and the speaker, the White House announced a new policy on Friday that banning all official, taxpayer-funded congressional travel for the duration of the shutdown, unless lawmakers had direct approval from Mr. Trump’s team. “Under no circumstances during a government shutdown will any government-owned, rented, leased or chartered aircraft support any congressional delegation, without the express written approval of the White House chief of staff,” Russell T. Vought, the acting director of the Office of Management and Budget, wrote in a memo announcing the change. Travel expenses also will not be paid for such trips, the memo said, suggesting that even if lawmakers sought to keep their plans and fly commercial, they would have to pay personally for the trip. Senator Lindsey Graham, Republican of South Carolina, was on one such trip to Turkey this week. Asked whether Mr. Graham would have to cover his travel and expenses, his office referred questions to the White House. An administration official said the policy would not apply to Mr. Graham’s trip, since he had departed before the change was made. Annie Karni and Katie Rogers contributed reporting.